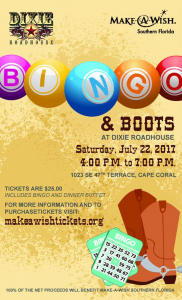 Make-A-Wish® Southern Florida will be hosting a Bingo & Boots event on Saturday, July 22 from 4 to 7 pm at the Dixie Roadhouse, located at 1023 SE 47th Terrace in Cape Coral. The fundraising event will include bingo, a dinner buffet, and a silent auction. All Make-A-Wish® guests who attend the Bingo & Boots event may stay and enjoy the evening at Dixie Roadhouse free of normal cover charge. Guests will also have access to the venue’s VIP area. The goal is to raise enough money to help grant the wishes of 11 children from Cape Coral. Tickets are $25 per person and may be purchased online at www.makeawishtickets.org. Please make your reservations by Wednesday, July 19. Sponsors helping to make this event possible include Dixie Roadhouse and VITAS Healthcare. Sponsorships are still available starting at $250; if interested in a sponsorship opportunity please contact Lesley Colantonio at 239-992-9474, ext. 22. Make-A-Wish Southern Florida grants the wishes of children with life-threatening medical conditions to enrich the human experience with hope, strength and joy. The Southern Florida chapter grants a wish every 16 hours. And they have granted more than 11,000 wishes since its inception in 1983. The chapter’s vision is to make every eligible child’s wish come true. For more information about Make-A-Wish, visit www.sfla.wish.org or call 239-992-9474.